Sunreef Yachts, the world leader in building luxury catamarans, constantly raises the level of innovations presented on its units. In 2013 Sunreef Yachts together with VOLVO engineers developed an innovative IPS system installed for the first time in a power yacht (60 Sunreef Power). This year specifically at a client’s request, Sunreefs` specialists installed the IPS system in 70 Sunreef Power 1 Life to ease maneuvering and accommodate side cruising and easy turning with just one joystick. Despite being widely used on regular motoryachts, they are very uncommon on catamarans, especially large-sized yachts in which the shipyard specializes in. Moreover, the system helps to be even more efficient on the fuel consumption side. To maximize performance 70 Sunreef Power 1 Life is equipped with wave piercers on both hulls. A special hydraulic platform is another innovation in 70 Sunreef Power 1 Life . The device, manufactured by the French company – Tenderlift, enables rapid exit of inflatable boats, scooters, skis etc. The platform, powered by a hydraulic system, is very light, simple and quiet in use. Lowered to 600mm underwater, it can carry devices up to 450 kg. Moreover, it can stop in any position on every level. The platform dimensions are 4300mm x 1780mm, and it weighs only 100 kg, so that it does not affect the boat's performance and can be fitted on every unit. The interior of the yacht is equally cutting-edge. 70 Sunreef Power 1 Life has a semi- open saloon, which means that the saloon space, dining area and lounge have direct access to the full beam master cabin located at the front of the yacht. The space is upholstered with white fabrics on the ceiling and walls with contrasting dark flooring. Vivid accessories (pillows, poufs and the carpet) make the whole room more dynamic. Glass accents are a feature not only in the saloon composing the table legs to create the illusion that the gray-beige grained wooden table is levitating, but also for the minimalistic stair railings, which have been fitted deeply into the floors. The couch and two poufs in the television corner are made ​​of soft comfortable leather in shades of gray. The area is completed with a TV wall, bookcase and a DVD rack. The 13 square meter master cabin is made of high-quality natural white fabrics which contrast with the dark brown chocolate oak floors. On the customer’s individual request, a specially designed glass wall (magic glass) separates the bathroom from the sleeping area. When turned on it is 90% transparent, and when it is turned off, it has a frosted aspect, providing privacy. A spacious, bright kitchen is fully equipped and includes a large fridge, two freezers, a microwave, dishwasher, cooking stove and a hidden pull-out table for the crew. The dominant colors in the master cabin are grays and blues. 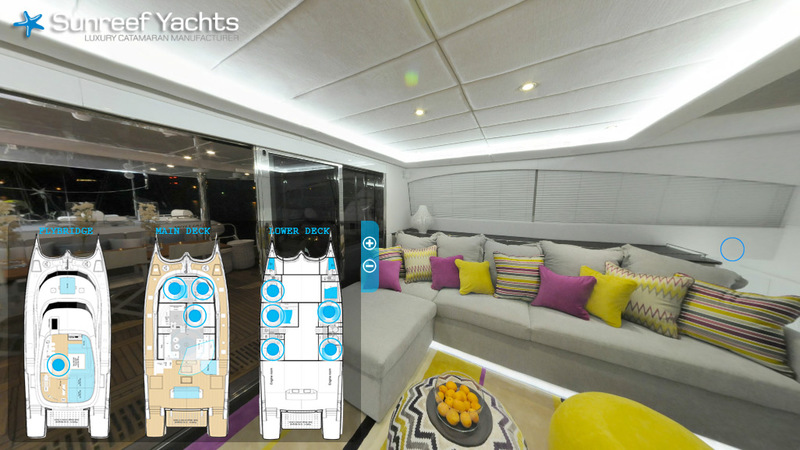 The same shades are also used in the aft cabins for guests, however the kid’s cabin, which contains 5 beds, is dominated by a mix of complementary blue hues and fuchsia. Each cabin has an en-suite bathroom, lots of storage space and a full-size wardrobe. The over 37 m² flybridge (dimensions without the wheelhouse and stairs) has a very comfortable seating and gym area. Under the roof there is a large “U”- shaped sofa and an adjustable in height table that can be converted into a couch. The area is full of soft pillow mattresses, under which there are thinner and harder ones that are perfect for physical exercises. Adjacent is the gym area, where fans of various work-outs will definitely find suitable equipment for themselves, with options that range from a stationary bike, cross trainer, a weight bench or TRX zone. After a bit of relaxation or exercise, guests can move to the barbecue station, which is also equipped with a refrigerator and an ice machine. Surrounded by tasty delicacies they can rest in the front area of the yacht, where they will find couches, mattresses and poufs. Amazing lighting has been installed on the yacht. There are day light colored LED strips on the outer contours of each room and additional lights also illuminate from under the sofas in the saloon and beds and mirrors in the cabins. The new 70 Sunreef Power has a total of almost 213 m² of usable space and can accommodate in the greatest comfort up to 12 guests.